With technology advancing faster and faster, parents are finding it more and more difficult to stay on top of how their children are using the internet. We spoke to mum and internet-safety guru Pamela Whitby about what you can do to protect your child online. A poll conducted recently by the Child Exploitation and Online Protection Centre showed that around 80% of children aged 5-15 in the UK are regularly online every day. With the myriad of technological gadgets available, as well as software to go with them, there are more ways for children to access the internet and more things for them to do once they get there. “Most research says children shouldn’t have more than two hours of screen time per day,” explains mum and journalist Pamela Whitby, author of Your Child Safe Online: a parents guide to the internet, Facebook, mobile phones and other new media, “but this is hard to achieve.” Screen time includes mobile phones and television sets as well as computers, so it’s likely most that children regularly exceed these two hours. And it’s what children do in those two hours – and who they meet – that parents don’t always know about. “The main concern for parents about children using the internet is safety,” she says. “You’ve got to be aware of what your children are doing online, even at school.” It’s not uncommon for young students to have passwords to managed learning websites at school, or play online games at home. “They’ll go on the internet to find games,” Pamela explains. Young children are just learning about what the internet can do, and aren’t necessarily aware of what search terms and websites can bring unreliable, scam-driven results. An OFCOM poll reports that 61% of parents for the 5-15 age group don’t have adequate online filters or parental controls in place. Six free online safety sessions combining a video and a quiz to test and reinforce what’s been learned are available from Azoomee and are an excellent way to discuss being smart, safe and kind online with your child. Because some games also allow chat, it’s important to help children learn that communicating on the internet is different from communicating face-to-face, such as on the playground or at school. “Tell kids to think about what they put on the internet, and what’s ok to say – once it’s there, it’s there forever and they can’t take it back,” explains Pamela. Be open and direct about stranger danger online. A survey by the (ISC)² Foundation’s Safe and Secure Online Programme on primary school children’s online behaviour has found that almost one-fifth of Y5 and Y6 pupils have met with someone in the real world they have previously talked to only online. Half of these children did so without taking anyone with them, whilst 18% of pupils surveyed reported feeling personally uncomfortable or upset when chatting with an online contact they have never met in real life. Get involved in wider debate about internet safety – speak to parents at school about what they’re doing, and visit websites such as Safer Internet and Parent Port to report inappropriate content and get advice. Know what the age restrictions are on social media websites. For instance, children under 13 cannot sign up to Facebook, but they can log on by giving a false birthdate. You can report instances of improper use. 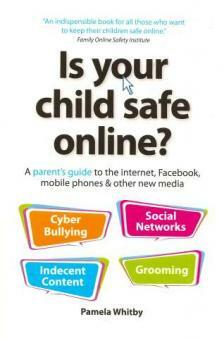 Understand your child’s school’s policy about internet use and cyberbullying. Research software that can block certain websites, and that records your child’s browsing history (such as Google SafeSearch). Use ctrl+printscreen (to paste (ctrl+v) onto a Word document) to keep a record of offensive chat messages. Keep your computer in the family room, and set a specific amount of time that your child can use the internet each day. Up to 40 percent of children clear their browsing history to keep it hidden and almost a third have created online accounts that parents don’t know about. Access the internet on your phone or tablet? Your child probably does too (and they may know how to use your smartphone or tablet better than you do!). Surveys have found that 1 in 5 parents admit their child knows their PIN and 1 in 10 share their iTunes password. Don’t give your children your password to unlock parental controls! The (ISC)² Safe and Secure Online (SSO) program brings cyber security experts into classrooms and to community groups to teach children ages 7-10 and 11-14 how to stay safe online. For more parents' information about online reputation, malware, password protection and texting read the SSO Top 10 Tips for Parents. Find specific tips for online gaming safety and mobile phone safety at ParentPort. Not sure if a game is suitable for your child? Understand app ratings and how to choose appropriate games for your child at AskAboutGames. You can filter the type of content available on a smartphone. Find out about the different mobile security tools available across the different networks and operating systems, including practical advice on installation, at Phones4U's Mobile Security site. Download clear, step-by-step guides to setting up parental controls on devices, search engines, apps and network providers on the Internet Matters website. Is your child accessing music, films and TV legally? By age 13, 42% of children regularly access illegal music, film, TV and video file-sharing sites and almost three quarters (73%) of children are introduced to them by their friends. Talk to your child about copyright and legal and illegal content websites; clear resources from Childnet are available to help you. Does your child have social media accounts? The minimum age to open an account on the most popular (Facebook, Twitter, Instagram, Pinterest, Tumblr, Kik and Snapchat) is 13 and it's 17 for Vine, Tinder and Yik Yak. YouTube requires account holders to be 18, though a child aged 13+ can sign up if they have their parent's permission. Facebook has launched a Parent Portal to help parents navigate their child's Facebook activity. Smartphones allow children to access paid services online – and as their parent, you are likely to be the bill payer! Find out more about hidden costs, text message scams, paid subscription services, in-app purchases and more on the parents' information pages on PhoneBrain. Is Your Child Safe Online: a parents guide to the internet, Facebook, mobile phones and other new media is available to buy from Amazon and Waterstones.